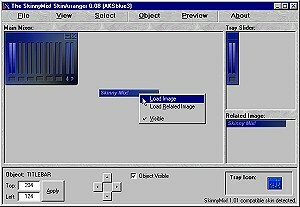 Description: This utility allows you to position the graphics of your SkinnyMix! Mixer skins. Other features include tool tip text modification and author description editing. This beta will work with versions 0.08 and higher of SkinnyMix! Mixer. Simply extract the contents of SkinnyMixSkinArranger.zip to the directory containing the SkinnyMix! Mixer and run SkinnyMixSkinArranger.exe. Installation: Extract skinnymixskinarranger.zip to the directory which contains "SkinnyMix! Mixer" and run skinnymixskinarranger.exe.